t, and will become tighter as previously announced measures come into effect. Firms must therefore continue to improve productivity, and society must change its mindset in viewing manpower as the only solution, said Acting Minister for Manpower Tan Chuan-Jin yesterday. "Economic restructuring is not about replacing lots of foreign workers with local workers. It is about producing the same or more value with fewer workers," said Mr Tan, who was addressing business leaders at the Singapore Business Awards (SBA) yesterday. A critical part of this is in changing individual and societal mindsets. Head honchos must engage and empower their people, and the society "must stop thinking of manpower as the sole solution", he said. Citing the example of automatic car washes which are common in other countries, he observed that in Singapore, with many car owners concerned with scratches on their cars' paintwork, car washes have been replaced by foreign workers. "Even if there is available technology to provide a 'swirl' free automatic car wash, we must still shift our mindsets in order for the technology to gain traction in Singapore." Mr Tan noted that the electronics sector has moved up the value chain from manufacturing semi-conductors to wafer fabrication of microchips over the past decades. "Inevitably, some businesses fell away at each step of the way - it was not easy at the time, nor indeed popular, but it has proved to be the right foundation." Mr Tan also called on bigger companies and multinationals to guide the way to higher productivity. "We hope that MNCs will draw on the innovations and practices from your operations overseas . . . and grow the productivity of your Singapore operations to the level of your most productive global units." At the awards ceremony at Resorts World Sentosa, Sam Goi, executive chairman of Tee Yih Jia Group, was named the Businessman of the Year for his far-sightedness and entrepreneurial spirit. His popiah skin manufacturing firm Tee Yih Jia has been a forerunner in automation, which helped to ramp up its production capacity. Compared to a stuffy and outmoded factory which produced 3,000 sheets a day by hand in 1977, some 35 million pieces run off its production lines now. The firm exports about 90 per cent of all its products. "I realised (when I acquired Tee Yih Jia in 1977) that Singapore's domestic market was limited, and only by exporting to the rest of the world, TYJ could then become a world-leading spring roll pastry manufacturer," said Mr Goi, who is also known as "Popiah King". The same ability to peer into the far horizons of the future similarly distinguished the other winners. ST Engineering CEO Tan Pheng Hock - who was given the Outstanding CEO of the Year accolade - saw an urgent need to diversify its geographical and customer base, as the business, like others, was hit by wave after wave of shock, from the dotcom bubble burst in 2000 to Sars in 2003. "These crises were real challenges to us, especially when we were moving from a Singapore-centric company into one with increasing global presence," he said. "But together, as a company, we have ridden out of the financial crises, and we have withstood the shocks to the global business environment." Two other awards - Outstanding Overseas CEO of the Year, which honours Singaporeans who have made a mark in other countries, and Enterprise of the Year, which recognises promising smaller local companies - were respectively given to McDonald's China CEO Kenneth Chan and Mencast Holdings. 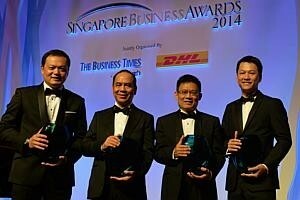 The SBA, jointly organised by The Business Times and DHL Express Singapore, is Singapore's oldest and most prestigious business award. Alvin Tay, BT editor and chairman of the SBA organising committee, said that the four winners have demonstrated leadership, vision and entrepreneurial qualities at their best. "We salute them and hope that they, together with SBA winners before them, will be like a shining beacon to all aspiring businessmen and entrepreneurs," he said. Said DHL Express Singapore managing director Herbert Vongpusanachai of the winners: "A common denomination underlying their successes is constant innovation, which is the only way to compete in the vibrant global marketplace." [SINGAPORE] The labour market here is certain to remain tight, and will become tighter as previously announced measures come into effect.